Set in a rural town in County Kerry over run by a Hollywood film crew, two friends are employed as extras. One has aspirations to get his own script turned into a movie and the other is mesmerized by the leading actress. The film does not accurately portray the town and its people and soon the extras begin to feel abused as the glamour wears off. 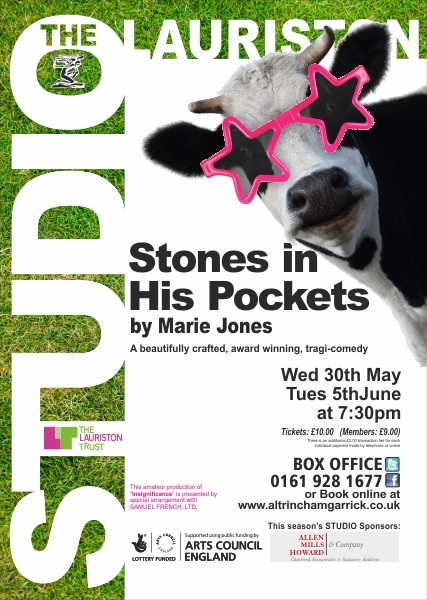 STONES In His Pockets is the unusual title for a grim comedy by Marie Jones. You may well ask what ‘stones in his pockets’ refers to? Well, it is the way Sean Harkin weighs himself down to ensure that his drowning suicide is successful. Perhaps now you understand what I mean by a grim comedy. Nevertheless, the play is lightly amusing and two actors accept the challenge of playing numerous parts. This ability is something I always admire. The skill of switching personalities .and clothes quickly is not something anyone can do. Anthony Morris and Jamie Sloan display agility as they master this art to its full. They could be described as masters of theatre as they swap roles, mime and master different voices not to mention Irish accents. The plot is about residents of a small town in County Kerry, Ireland who are paid the untold riches of ?40 a day to be extras in a Hollywood film. The main parts played by Anthony and James are Jake and Charlie, two of the extras. They also transform themselves into the flirtatious female American star of the film, the English director of the production and numerous other colourful characters. Director, Celia Bonner successfully underlines the differences between the extras and their brash, noisy new neighbours. * Stones in his Pockets is at the Garrick?s Lauriston Studio Theatre until Tuesday, June 5. For tickets telephone 0161 928 1677 or book online at altrinchamgarrick.co.uk. Star rating: * * * *.